Sometimes, you want a no fuss meal. Enter Deconstructed Grilled Chicken Fajitas. On an exhausting weeknight, the thought of boning and slicing the chicken seemed superfluous. So, I served them up deconstructed with the tortillas and veggies on the side to assemble or simply eat as you please. It’s #FarmersMarketWeek!! Did y’all know that? It is! I love Farmers Market Week!! It’s that time where I get to share the delicious produce and products I can get at my local farmers market. And mine has a LARGE array of items for sale, which makes this even more exciting. This time last year, I was praising the market by work. Which was amazing. It had good produce, but lately, it’s more about the cooked food. It’s a great place to stop for lunch, but my favorite produce vendor isn’t there anymore. Which saddens me. She had KILLER produce that was different and not common at all. This year, however, we’ve been going to our local farmers market that’s minutes from the house. It has a large selection of items to help cook up a farm to table meal any day of the week. Not only are there fresh fruits and vegetables, but there’s fresh frozen fish, organic free-range meats of all kinds, a food truck or two if you get hungry, fresh pickles, kombucha, honey, peanut butter, kettle corn, and fresh baked breads and pastries. I bought the onion and peppers from the market for this recipe. However, I didn’t buy the chicken. I already had some in the fridge, but I could have! There’s free range chicken and eggs for sale at my market from at least 2 vendors. There’s beef. We bought an 11-pound brisket one weekend when I was testing my grill smoked brisket method and recipe. The hubs and I have enjoyed the line caught, fresh frozen fish that’s available for purchase there, too. We’ve had haddock which I DEVOURED and rock fish. The ling cod was different. I’d rather have the rock fish next time. Then there’s the haddock cheeks I can’t wait to try. I look forward to having fish from them every week. AND it silences the hubs on the “you can’t get fresh fish here” argument. No, it’s not Naples Florida fresh, but it’s the best tasting fish we’ve had here in forever. Mine also has pickles. Two vendors worth of pickles. I’m tempted, but always forget to get cash and they don’t take plastic. I’m craving me some bread and butter pickles, though. I might have to break down and stop at the ATM on the way this weekend. We’ve purchase olive oils and vinegars! Along with some spice mixes from those vendors. We love the olive oil from the Manassas Olive Oil Company. Their garlic olive oil is so delicious. We almost use it exclusively now. We could even get breakfast or lunch there. The sausage vendor sells breakfast biscuits and there’s typically two food trucks. This week there was a third truck that had the most amazing smelling donuts dipped in maple that smelled sinful. If they’re there this week, I’m not sure I can resist. Just saying. I almost remade this recipe. ALMOST. The hubs cooked the thighs, because he’s the grill master. When he pulled them off, he said “These look pretty!” And they did. See? They looked perfectly cooked with great grill marks. They looked moist and delicious. Of course, I couldn’t NOT photograph them. I had to! Because they did look so perfectly delicious. You can’t tell me that you’re not drooling. I’m drooling. That plate looks so hearty and delicious. And perfect for a summer weeknight meal. 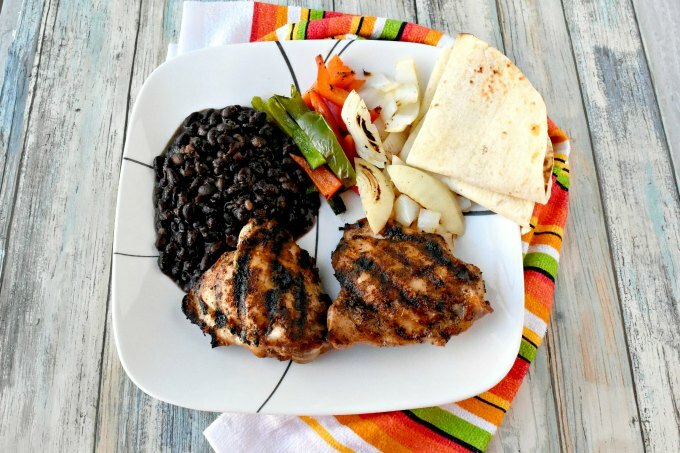 The sweet onion, the sweet peppers, the flavored beans, and the toasted tortillas all make for a deliciously simple deconstructed grilled chicken fajita. I simply rubbed the thighs with fajita seasoning. Which I realize I haven’t shared yet. I really should because it’s a delicious spice mix. It’s similar to my taco seasoning with but a few twists. I’m almost positive you will not be able to guess the extra flavors in my fajita mix. You’ll just have to wait and see when I share it. Now, when I dove into these deconstructed grilled chicken fajitas, I tore the fajita up into pieces. Then I grabbed some onion, pepper, and chicken and wrapped little bites in the torn pieces of fajita tortilla. That’s how I ate my fajitas. And they were delicious! You can grill peppers and onions like this all the time. Just throw them on the grill. I do that with corn, too. You wouldn’t believe how delicious that is. I don’t even clean the corn. I just trim the ends and the silks and toss them on the grill. When they come off, that’s when I shuck them. Not before. Vegetables are so easy and delicious on the grill, don’t you think? I’ve been known to thick slice zucchini and aubergine to grill for a side dish. The flavor of the vegetables just shine when they’re cooked like this. The char caramelizes and the grill leaves a smoky flavor that’s delicious on fresh vegetables as much as it delicious on meats. Just like that char on the onion and peppers you see there which is full of SO much flavor. The hardest part about this meal is remembering to time the chicken. Seriously. If you’re not good at setting a timer like we aren’t, then it will be a challenge. But, if you’re good at setting the timer, then I can’t imagine anything about this dish will be difficult. It’s super simple and oh so delicious. 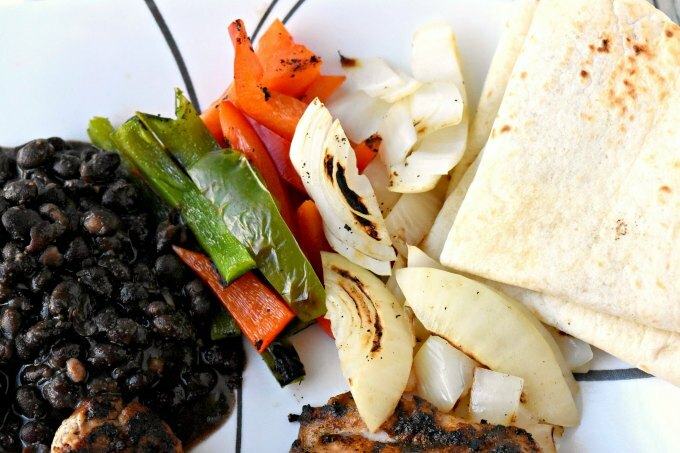 Have you tried fajitas at home? What are your favorite toppings? I hope you’re check out what the rest of the bloggers cooked up today. I know it’s something delicious! Sprinkle both sides of the chicken thighs with the fajita seasoning. Cut the bell peppers in half. Slice in half and remove the seeds and membrane. Remove the skin from the onions and cut into 1/4 to 1/3 inch slices. Place the beans in a small pot on low heat on the stove. Stir in the cumin and chili powder along with salt and cayenne pepper to taste. When the grill is heated place the chicken thighs on the grill and cook 8 to 10 minutes. Turn the thighs over and cook an additional 8 to 10 minutes or until the internal temperature reaches 165F. When you turn the chicken thighs over, drizzle the pepper halves and onion slices with olive oil and place on the grill. Cook 4 minutes per side or until tender. When the chicken reaches 165F remove from the grill and let rest 10 minutes before serving. While the chicken is resting, slice the peppers and onions and heat the tortillas. (I used the grill since it was still hot but you could use your gas stove, oven, or microwave). Use a potato masher and mash some of the beans to thicken them. Serve your deconstructed fajitas with your choice of additional toppings like tomatoes, sour cream, salsa, or rice. 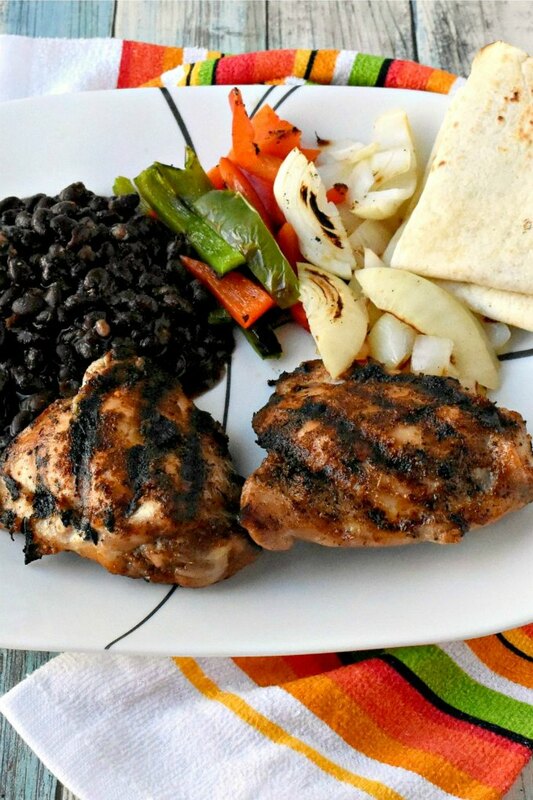 I love that you have made these chicken fajitas deconstructed. Grilling the chicken and peppers makes for easy clean-up too! The beans have a great flavor from the spices. Tasty recipe! Thank you! It does make for easy clean up. And since the grill is already on, might as well cook the peppers and onions. 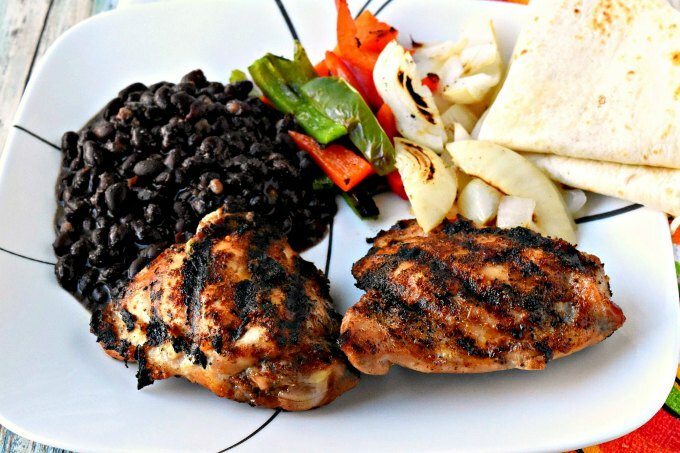 One of my favorite meals, and I can’t wait to try it with the thighs! This dish looks fabulous! Fajitas are my fave, too. Having them deconstructed makes for quicker eats. 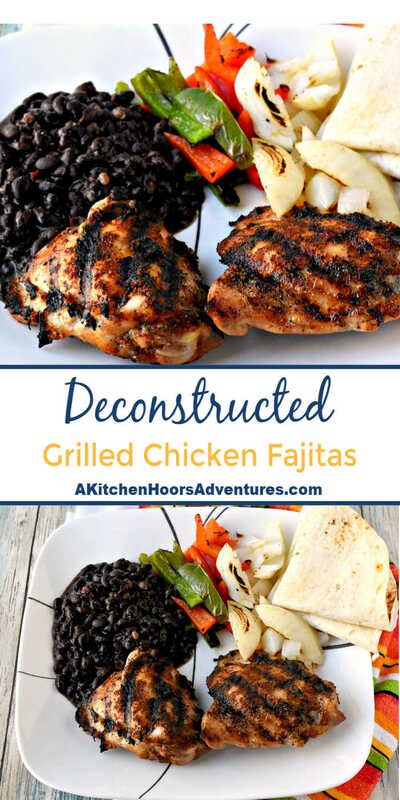 I think I like your deconstructed version more than the traditional fajitas! Makes for such a quick, weeknight fajita dinner. I do love the growing selection of products from local farms at farmers markets now, compared to several years ago. Yours sounds like a great one! And I love the idea of deconstructed fajitas. Definitely less work for the chef in the kitchen! For sure! I love seeing what’s being sold every week. One recipe has a specialty nut butter from the market. This looks scrumptious! What a great way to enjoy those farm-fresh veggies! Fajitas are a favorite in our house. I love the deconstructed idea and will have to try that next time I serve them. They’re so easy to incorporate into many meals. I love black beans. Sounds like you have one great farmer’s market! Lucky you! It is always packed for such a small town. Yes, I’m drooling! They are gorgeous!! Sounds like a delicious meal with those grilled veggies. We LOVE grilling vegetables in summer. This is a wonderful cookout idea! 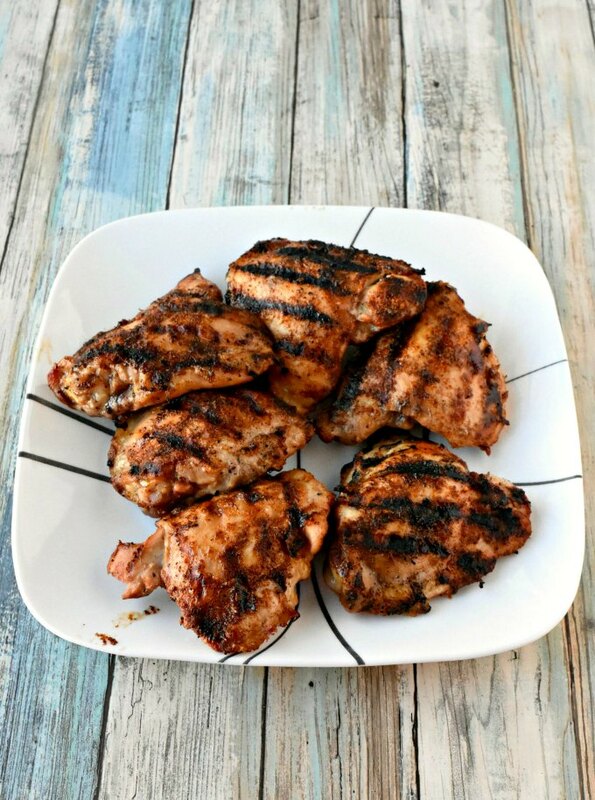 Those grill marks are gorgeous! That looks like an absolute perfect dinner to me. I love all of the textures and flavors on the plate! I think the bigger bonus for me here is cooking on the grill, we’ve had such warm weather I don’t want to heat up the kitchen, plus add in the yummy grilling flavors too. Yum! Yes! I’m all about the grill in summer. I hate cooking on the stove when it’s such high humidity outside. 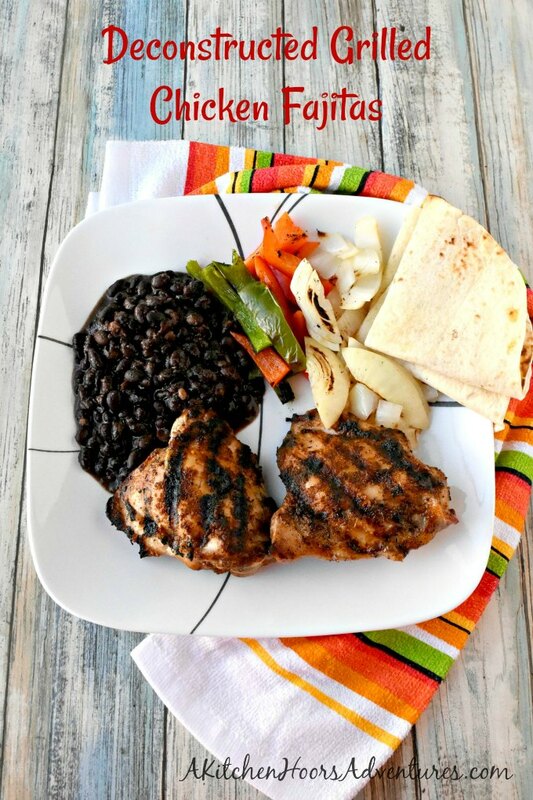 I love fajitas, and the grilled twist here sounds delicious! We’re always looking for fun new recipes for the grill during the summer. And I love wandering around farmer’s markets! Unfortunately, the one in our area is about a 25+ minute drive each way, so we don’t make it up there as often as I’d like…but I think you’ve inspired me to check it out this weekend now! We have fun at ours! Of course, we’re not there long but it’s great to see the new produce and finding the best deals. Sort of like a flea market, you walk around once for the best deals then buy your produce. This is a great idea Christie. Less muss, less fuss and same delicious flavors. Definitely! Exactly what I was going for.